Dear female readers, please do take some time to consider this small but really helpful campaign happening on the 2nd of October 2013 from 9am to 4pm. It will be held in Syopz, Taylor's University Lakeside Campus. This campaign is specially brought to you by LPPKN. The campaign will be held in 4 different universities in Klang Valley, including Taylor's University Lakeside Campus being the very first. What is HPV and HPV Vaccination? The Human Papilloma Virus (HPV) vaccine prevents infection with certain species of human papillomavirus associated with the development of cervical cancer, genital warts, and some less common cancers. I do not know exactly what it means scientifically but I certain that it is a form of cancer. HPV is also 3rd most common cancer among Malaysian female. 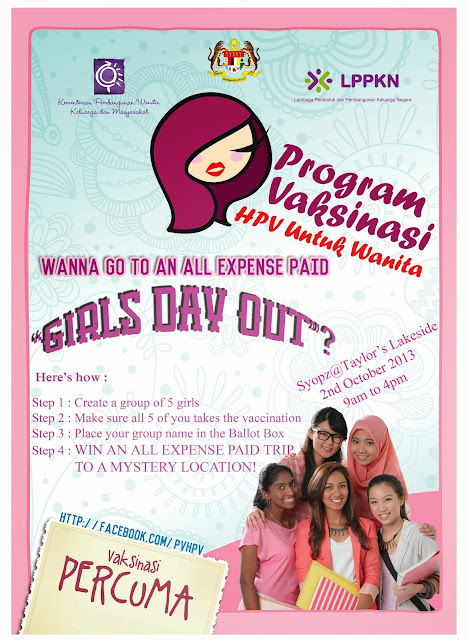 Create a group of 5 girls, take the vaccination, submit your group name and stand a chance to win an all-expense paid trip to a secret destination “Girl’s Day Out”. All members of the group have to participate in taking the vaccination and once completed, put your group name in a ballot box and pray! The destination of the trip is a secret but I am very sure it will be really awesome. The map above will direct you to the location. 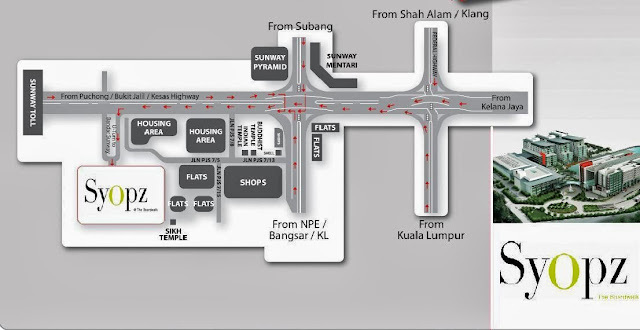 Syopz is located INSIDE Taylor's University Lakeside Campus. This is a good job for make HPV free. We should continue the Vaccination Campaign for every year.